About Antoine M. Garibaldi, Ph.D.
by Detroit Mercy President Antoine M. Garibaldi, Ph.D.
Good morning, Detroit Mercy colleagues, and welcome to the 2018-2019 academic year. As is customary, many of us have been working on the McNichols, Corktown and Riverfront campuses since the May 11 and 12 commencements. But three months have passed by very quickly and I hope you had a chance to get some rest and relaxation as well as the opportunity to spend some enjoyable time with your families. Many people who are not in the field of higher education believe that colleges and universities are not very active during the summer. But those of us who have spent most, if not all, of our careers in this rewarding career know that we are as busy during the summer as we are during the academic year. And that is why I am very appreciative of all of you -- staff and faculty, and even our students -- who have been assisting prospective students to consider enrolling in the University and also working with new and current students in their Summer Orientation programs, class schedules, financial aid and scholarships, student accounts, summer school classes, residence hall assignments and much more. Your dedicated efforts are very much appreciated by the new students and their parents. The personal attention you provide to our students are complimented both verbally and in e-mails to me and many others at the University. Thank you! That same appreciation extends to our facilities and maintenance staff who make our campuses look absolutely beautiful throughout the year, but especially during the summer. I not only see it but I also hear the compliments from visitors, prospective students and many of our alumni who are coming back to the campus more often for visits and activities. Many of our buildings and classrooms have been renovated, and you may have seen some of them on the slide show during breakfast. (You will be able to view them again during lunch if you missed seeing them.) With our two summer school sessions, growing numbers of educational camps for secondary, middle school and elementary school students, the McNichols campus is a busier place during the summer. And that is really good news as our University Services staff can tell you. Thank you to each and every one of you who make our three campuses come alive during the summer. As we begin this 141th academic year of University of Detroit and the 77th academic year of Mercy College of Detroit, I want to give you an assessment of the progress we have made and are making while also telling you how much more we must do in order to be a strong viable institution for the next decade and beyond. There is much good news but we also must become more financially and management efficient to counter the headwinds of a rapidly declining number of 18-year-olds in this state and region; and a citizenry that believes higher education is not only overpriced but may not be worth the money and time students spend in our institutions to obtain a degree at the undergraduate, graduate, and professional levels. Competition for undergraduate students in the metropolitan area, as well as throughout the state, is vigorous and very noticeable on television throughout the day and night. We know that competition will grow and that is why the Detroit Mercy 2020 plan was developed last year. I will provide you an update on the plan further into my remarks. Over the next few minutes, I will focus on three topics: (1) the positive trends on our first-year and transfer student enrollment and the progress of The Campaign for University of Detroit Mercy; (2) an update and the work to be completed on University of Detroit Mercy 2020: Envisioning a Boundless Future; and (3) the numerous activities of The Live6 Alliance, the economic development organization that the University co-established two years ago, and its office that is under construction on McNichols Road. I begin with some highlights on our first-year students and preliminary registration statistics. Enrollment Projections for 2018-2019 – As of Monday, August 13, 2018, 583 freshmen have confirmed for Fall. Last year 550 freshmen were confirmed as of this date. This is a 6% increase. Confirmations of graduates from Catholic high schools total 100, compared with 103 last year; 82 of the confirmed students are from the Detroit Archdiocesan high schools compared with 86 last year. Of those students from Archdiocesan high schools, 66% qualified for the higher grant, which indicates that they completed elementary school and high school at an Archdiocesan Catholic school. Last year that percentage was 54%. Our Student Orientation, Advising and Registration program (SOAR) participation rate for this summer is 100%. All students have either attended or are scheduled to attend our orientation program. That is very important because it increases the chances that they will be successful during their first year. Freshman Profile – The new first-year students have an ACT composite score average of 25 (25 last year), an SAT composite of 1147 (1135 last year) and a high school grade point average of 3.6 (3.6 last year). Twenty percent are in the top 10% of their high school graduating class compared with 25% last year, and there are eight (8) Valedictorians and Salutatorians. Twenty-three confirmed first-time students have also been accepted into the University Honors Program. One-hundred-sixteen (116) freshmen will be the first in their family to attend college (131 last year), and another 91 students (80 last year) will be the first in their family to receive a bachelor’s degree. Of the 583 confirmed freshman students, 194 or 33% are Pell-eligible (35% last year). Fifty-eight percent of freshmen are women compared with 62% last year. Fourteen of our incoming freshmen are international students and 83 percent (87% last year) of our incoming students are from Michigan. Our new undergraduate students will be coming from 18 states: California, Florida, Georgia, Illinois, Indiana, Kansas, Michigan, Minnesota, North Carolina, New Hampshire, New York, Ohio, Pennsylvania, South Carolina, Tennessee, Texas, Wisconsin, West Virginia; and 17 countries: Belize, Australia, Canada, China, Croatia, Egypt, Georgia, Germany, India, Jamaica, Lebanon, Mexico, Pakistan, Philippines, Romania, South Korea and Ukraine. As of Monday, August 13, 169 new transfer students were registered for the Fall compared with 179 in Fall 2017; and 267 new graduate students registered compared with 243 last year. There are 25 confirmed freshmen for the fourth cohort of the NIH REBUILD Detroit program compared with 15 last year. The students began this summer with a summer bridge program. With respect to registration for Fall 2018, as of August 13, 2,566 undergraduate students are registered compared with 2,507 in Fall 2017, a 2.4% increase; and 878 graduate students are registered compared with 881 in 2017, a very slight decrease of .3%. The professional school enrollment is at 1,171, compared with 1,173 last year. The professional schools have already exceeded their budget forecast of 1,139 by 32 students. More students will be registering for classes over the next two weeks. The overall preliminary registration total as of August 13 is 4,615 compared with 4,561 at this same time last year, which is a difference of 54 and a 1.2% increase. With Term I beginning in two weeks, there is still time for us to increase the enrollment of new students and returning students, especially in those areas where we are observing a decline from last year. Therefore, I encourage you to refer students to the Admissions, Financial Aid or College/School offices if they are having any problems registering. Our housing registration numbers are 2% higher than last year: 817 vs. 802. Approximately 50% of McNichols freshmen will be residing on campus. University Advancement and Comprehensive Campaign Activities Update – We continue to make good progress toward our $100 million goal for The Campaign for University of Detroit Mercy. You may recall that the public phase of the campaign was announced last October with a special dinner to thank many of our alumni and friends who have made significant gifts and included a panel of two major philanthropic and civic leaders who have close ties to the University and are advancing major initiatives of the city of Detroit -- President and CEO of The Kresge Foundation, Rip Rapson, and alumnus Matt Cullen, Principal of Rock Ventures, LLC and CEO of JACK Entertainment, LLC. The panel was moderated by our alumnus and new Trustee, Ron Fournier, former editor of Crain’s Detroit Business and now President of Truscott Rossman. It was an uplifting evening with many of our alumni and friends who had helped us raise more than $75 million in gifts, pledges and charitable estate plan expectancies at this time. $10,879,257 for Unrestricted and General Support toward the $10,000,000 goal. Alumni Relations has been vigorously working to increase alumni engagement with more than 2,300 individuals expressing an interest in assisting their alma mater. And we continue to host alumni events across the country. And, as you know from correspondence about the third Fall Homecoming Celebration on September 28 and 29, our program is almost final. More details will be provided in Campus Connection, but go to the Homecoming website for more information on this fun-filled weekend. Detroit Mercy 2020 Update and Our Work This Year – As I mentioned last year, our most recent five-year strategic plan ends this year. Much of attention since last June has focused on our fourth goal: effective management and financial health. Over the last fiscal year, we took several significant steps to address that goal by: making our tuition more affordable to students and their parents by re-setting our undergraduate tuition from $41,000 to $28,000. We also adjusted our student financial aid proportionately to parallel the new $28,000 tuition price. A voluntary employee service incentive program was also offered, and 108 employees accepted that opportunity. Also, we have decided to discontinue some academic programs that have not generated an adequate number of students to justify continuing those academic degree programs. Similarly, we have made other structural adjustments throughout the University that include reducing the number of public safety officers and streamlining our athletics programs. All of these decisions are absolutely necessary to assure that we will be in a sound fiscal position over the next five years. While the VESIP initiative was positive, we also had to replace many of the positions that will be vacated. Therefore, the President’s Council still has some very significant work to do in order to achieve the proposed annual expense reductions we proposed. The primary rationale for establishing the Detroit Mercy 2020: Envisioning a Boundless Future program was and continues to be to strengthen the University for its long-term viability. Because of the tuition reset, we are confident that we have attracted and enrolled more students for this Fall 2018 semester and particularly for Fall 2019, despite the declining number of college-aged students in Michigan and the Midwest. We have explored and implemented some structural changes since last year to generate more revenue and to be more financially efficient. We will be doing the same this year so that we can sustain the University’s vibrant and boundless future. Strategic Plan: 2018-2023 – Significant progress was made on each of the strategic goals over the last five years; but we are investing more time and enhancing our efforts even more to further increase our enrollment, retention and graduation rates. The Strategic Planning Team began the process of developing the next five-year plan last academic year, and they have been meeting bi-weekly since October of 2017. The Strategic Planning Team first reviewed many of the University’s internal data sets to determine the pertinent information. They also conducted “visioning exercises” with team members serving as facilitators. The team was interested in engaging with anyone in the University community who wanted to participate in setting goals for the University. Beginning with Colleagues Day in January of 2018 and continuing over the course of the year, more than 25 sessions were conducted with groups of faculty, staff and students. Over 400 community members participated in the sessions. Information was also solicited through an electronic suggestion box that was located on the website. Three primary goals were identified by the Strategic Planning Team and objectives for each goal were formulated. The team will give feedback to the community so they can “fine-tune” the goals over the next month. Completion of the plan is scheduled for February of 2019. Open sessions will be held during the week of September 27, so please contact any member of the team if you are interested in participating. Live6 Alliance Activities – The Live6 Alliance, under the leadership of Cecily King, has developed several new programs and events to further enhance and strengthen our McNichols-Livernois neighborhood. I continue to serve as the Live6 Alliance Board Chair and we have obtained excellent financial support from The Kresge Foundation, JP Morgan Chase, and other foundations, in addition to the modest annual contribution we provide. The University continues to receive favorable recognition for leadership we are providing in these neighborhood efforts. Please go to the Live6 website to see how you can get more involved and to find out more about upcoming events. Live6’s headquarters, HomeBase on McNichols Road (between Prairie & San Juan), is still under construction and we are expecting a “soft-opening” in mid-September. Colleagues, we have made good progress in several areas, but we still have much more work to do to become an even stronger institution this year and in the future. Our reputation locally and regionally is growing; our enrollment is growing; our alumni are becoming more engaged and giving more to the University; and your daily contribution to the University and our Mission are absolutely critical. I thank you for all you do for Detroit Mercy! Thank you, Dr. McKinnon. University of Detroit Mercy Board of Trustees Board Chair Michael McNamara; Trustees Sr. Rosita Schiller and William Young; today’s speaker, Mrs. Nancy Greening Kennedy; Faculty, Staff, and Students of the University; Parents, Spouses, Relatives and Friends of the 2018 graduates; and, most especially, the 2018 Graduating Class of University of Detroit Mercy. We are happy to have you here for our 2018 McNichols Commencement Ceremony. We are here today to celebrate the accomplishments of our graduates; but I want to begin today’s ceremony by asking you to join me in wishing all of the mothers in the audience an early Happy Mother’s Day. Your mother and father and the other special people in your lives who are present today – your grandparents, spouses, brothers and sisters, aunts, uncles and other relatives, best friends, neighbors and many others – have been your biggest supporters and know how hard you have worked to make this dream a reality. You have devoted many long hours to studying, while also holding part-time and full-time jobs, and, in many instances, managing family responsibilities also. Your families and friends are happy as most of you begin and others advance in your varied professions. So make sure to thank them today and over the next few days for their inspiration, encouragement, and support. In case you have not realized it, commencements are often more for your family than for you. Your McNichols Campus class of undergraduates and graduates totals 1,177! And like many previous classes of bachelor’s, master’s and doctoral graduates, you are similar in some characteristics and different in others, particularly with regard to your ages, gender and hometowns. For example, seventy-four percent, or 515 of the 700, baccalaureate degree candidates are 25 years old or younger – with the youngest being 19 and the most seasoned in the early 70’s. Almost 50 percent (49%), or 218, of the 447 master’s and specialist graduates are under the age of 30 and the oldest candidate in the early 60’s. And our 17 doctoral candidates range in age from 28 years old to the 70’s. And women outnumber men in our undergraduate, graduate and doctoral graduating classes -- 59% women and 40% men! While the magnitude of the gender gap has been growing nationally in higher education over the last two decades, there are ways to increase the number of men attending and completing undergraduate, graduate and professional degrees that will bring their numbers closer to the outstanding numbers that women have achieved. With regard to hometowns, 81%, or 959, of our graduates are from Michigan; six percent (73) come from 20 other states; and the remainder (120) come from 17 countries, including Belize, Canada, China, Congo, Ghana, Indonesia, Italy, Libya, Mexico, and Netherlands. We know that those ages, gender and hometown similarities and differences provided you with a rich educational experience that you will treasure for the rest of your lives and use well in your professions, careers and the communities where you will live and serve. Even though you have chosen many of our 100 academic majors for a degree that will lead you to a lifelong career, “your calling” in each of those professions is not the same as the response you would give to a friend or stranger who asks “what do you do?” Your “calling” is not “your job” or “your work.” Rather, your calling is closely aligned to the vocation you are about to begin and that you have chosen. The root of the word “vocation” comes from two Latin words – the noun “vocatio,” which means “a calling” or “a summons” and the Latin verb “vocare,” which means “to call.” Vocation is also defined as “an occupation to which a person is specially drawn or for which he or she is suited, trained or qualified.” As a Catholic university that is Jesuit- and Mercy-sponsored, we know that the word “vocation” had its origins in Christianity and it is commonly used to refer to a person who is interested in devoting himself or herself to religious life. But “vocation” is used today in many non-religious contexts and certainly applies to almost all professions. To fulfill your calling, you will need to fully use your degrees. For example, you can choose to teach, conduct research, discover cures for diseases, invent innovative products and instruments, design facilities and autonomous vehicles and much more. You can also mentor others who are interested in your profession and become involved in service activities similar to the way that you have volunteered locally, nationally and in other countries during your years as a student. Remember the people and non-profit organizations you assisted and continue that level of community service during your career. Transform the gift of education that you have received here by sharing it freely with others who can benefit from it. Your calling will come into sharper focus as you realize that whatever you select, it will be your ultimate purpose in life and the goals you want to achieve after a successful career. Thus, when you reach the end of your profession, you will follow proudly in the footsteps of tens of thousands of University of Detroit Mercy alumni who have preceded you over the last 141 years. And as you ponder “your calling,” use our commencement speaker and distinguished alumna, Mrs. Nancy Greening Kennedy, as a role model. Her exceptional career as an entrepreneur, philanthropist, and active civic, community, religious and university volunteer is a useful marker for you to use as a baseline for your service. If you can be half as busy as Mrs. Kennedy is now when you are at the peak of your career, the university will be very thankful for your dedicated service. Finally, stay close to your Alma Mater and your School or College as you bring distinction to the University and your profession during your outstanding career. Congratulations and much success, Graduates, and may God’s blessings be with you and your families always. 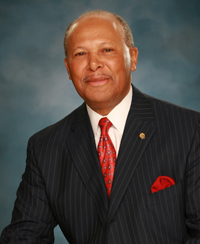 - President Antoine M. Garibaldi, Ph.D.
As an urban University, we are committed to nurturing the well-being of our community in metro Detroit through educational initiatives, professional services and community investments. Since 1877, the University has been a valuable higher education resource to both Detroit and southeastern Michigan. Please take a look at our document, University of Detroit Mercy's Economic and Community Impact on Metro Detroit (PDF).